During a very tiring Contemporary Istanbul Art Fair it was a relief that Sakıp Sabancı Museum invited Anish Kapoor to do his first solo exhibition in Turkey at the same time. But while Kapoor’s show manages to close a few gaps in Istanbul’s contemporary art scene, three exhibitions at the institutional art space ARTER and its newly opened subsidiary BAHANE (which means ‘excuse’ in Turkish), are going for a whole new beginning – a redefinition of contemporary art in Istabul. 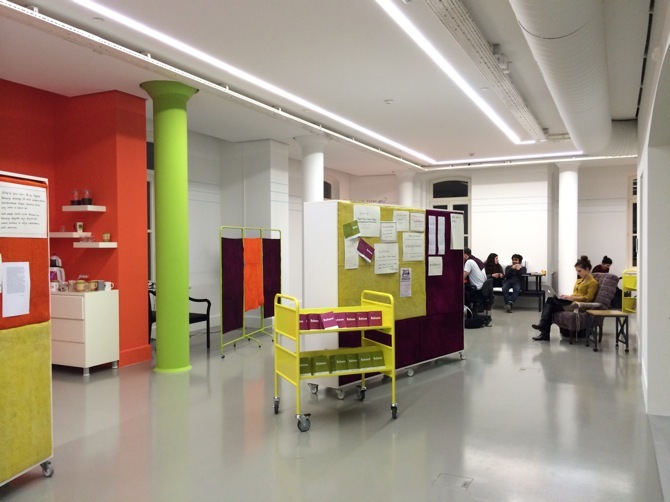 Planned for a duration of two months for a start, BAHANE is directed by İlkay Baliç and İz Öztat as an art space that is located in an old apartment, combining exhibitions with a library, video screenings and reading sessions. 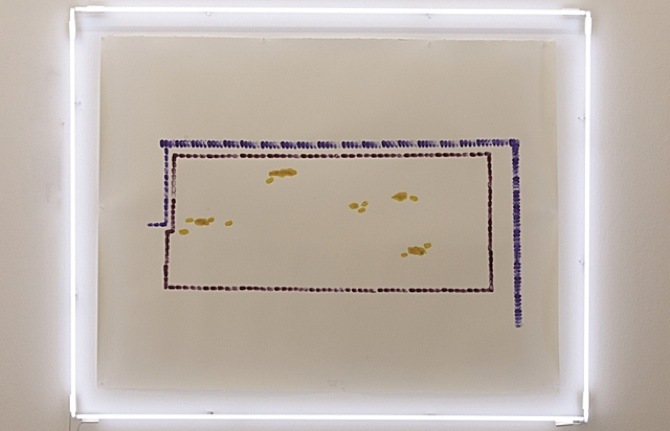 ARTER currently has a different exhibition on each of its three floors, including solo shows by Aslı Çavuşoğlu, Fatma Bucak and the established artist Sarkis. 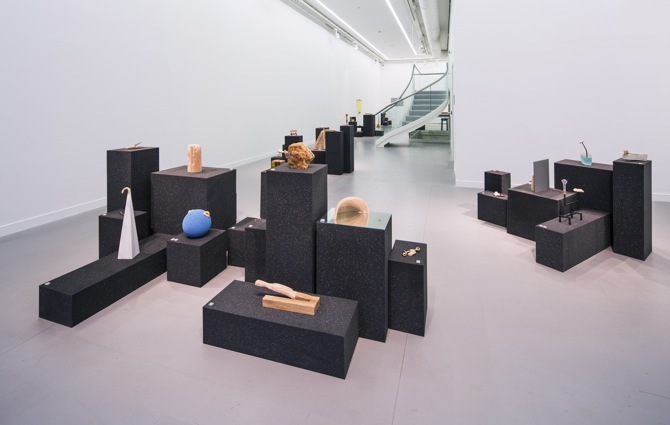 The first floor at ARTER displays Aslı Çavuşoğlu’s “The Stones Talk”, which is curated by Özge Ersoy. Çavuşoğlu created 71 different objects, representing archaeological artefacts which were being labelled as being "not worthy" to be exhibited by The Ministry of Culture and Tourism of the Republic of Turkey. She (re)produced these objects by using the original materials such as wood, ceramic, bronze, iron and exposes them as to defend their value, their aesthetic appearance and their past stories. Every object is connected to its original – referencing the shapes and the conditions of the artifacts. 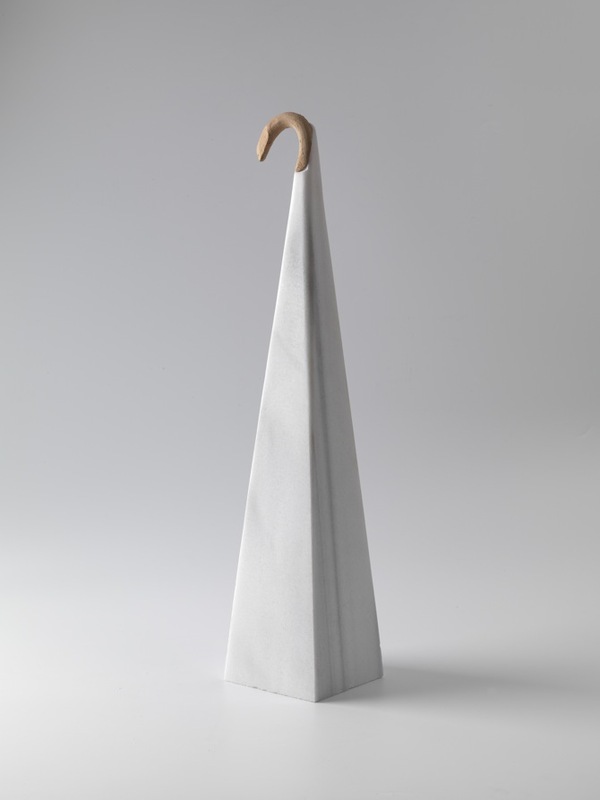 This creates a sense of walking through an archaeological museum and similarly it refers to the political dimension that these rejected objects represent. Her show is both, calm and punchy. The second floor displays the striking exhibition “Yet Another Story About the Fall” by video artist Fatma Bucak. As it is Bucak’s first solo show in Istanbul, curator Başak Doğa Temür considerately approached the delicate subject on gender and identity-based discrimination and worked with the space by transforming it into darkness. Only the corners are exposed to light, which originates from one of the four main video installations. 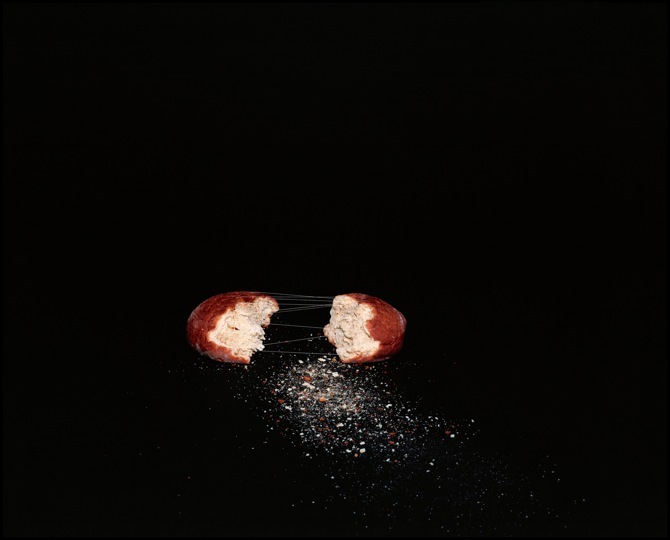 The photograph “Blessed Are You Who Come – Solida Fundamenta" (2012), which belongs to a humorous video with the same title (see an excerpt of the video here), shows two pieces of bread detached from each other, yet loosely sewed together. 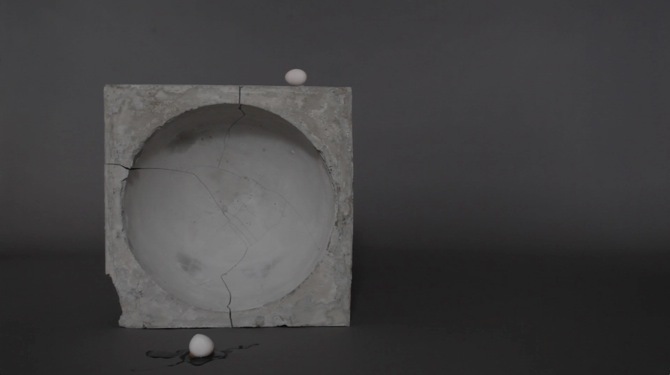 Fatma Bucak’s concept leans on religious parables and myths, while she re-creates panels between these subjects through her videos. 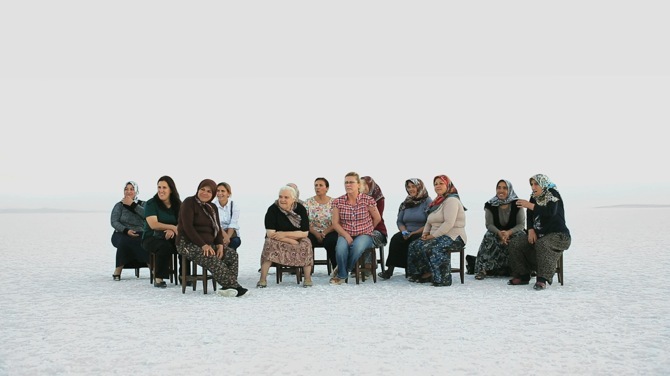 Each work is sudden and disturbing, except the site-specific two-channel video projection “Suggested Place For You To See It” (2013): It shows 13 women sitting on chairs in the middle of nature – on Tuz Gölü, a salt lake in mid centered Turkey. The women comment about Bucak’s video "And Then God Blessed Them", which is located across in the actual exhibition room. Also this video is staged in the middle of nature, only showing the artist and her brother in a physical interaction. Creating an interplay between both video works, this outstanding exhibition puts the visitor in a performative situation and allows reality and staged scenes to merge. The established artist Sarkis shows a combination of three works in the third floor at ARTER. Inspired by the music of John Cage and the garden Rjoanji in Kyoto (Japan) Sarkis simply titled the exhibition "Interpretation of Cage/Rjoanji" and cooperated with curator Merih Fereli. Timed to start every 20 minutes, a disturbing musical composition by Kudsi Ergüner (ney) and Jean-Francois Lagrost (shakuhachi) dominates the space and accompanies Sarkis’s centre piece "Cage / Rjoanji flute partition according to Sarkis". 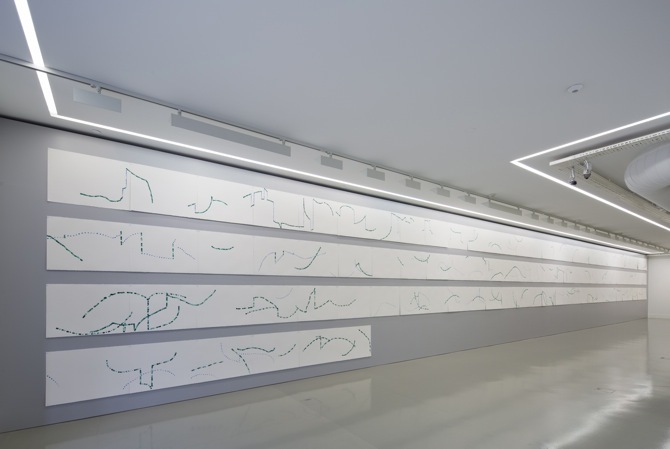 Consisting of 96 sheets and 96 different watercolours, which he created with his fingerprints on paper, the work takes the shape of large and wall-filling waves, confronting the curator's musical contribution with an opposition of material. Also the second work consists of watercolours on paper, additionally incorporating neon lights, which is another link to Rjoanji. His third work – an oil painting on paper, suggesting itself as a map for the Japanese garden – is most explicitly related to his inspirational source. Understanding the three works and the musical composition as one coherent installation, Sarkis’ exhibition documents the steps – the journey – of inspiration.